Greenhouse size is determined by the width and height. The height will determine climate inside the greenhouse and the width will determine what crops you will or can grow in the greenhouse. 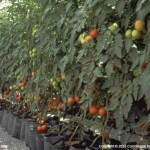 So what is the ideal greenhouse size; well, it is not a simple answer. It requires some holistic thinking, but let’s see what the scientist have said about the subject. Various trials have concluded that height is one of the most important factors in reducing temperatures inside greenhouses found in tropical to arid climates, such as in Africa. The average height of greenhouses build in arid areas such as Africa, are approximately 2.4m to the gutter and 1.6m to roof tip. Total height of the multi-span is 4m. It has been found however that the height in arid to tropical climates should be increased to at least 3m to the gutter for better ventilation and temperature control. The average width of most multi-span greenhouses is less than 10m, usually 8-9m. The reason is that during rainy periods, puddles accumulate between the two top supports running longitudinally because of the plastic covering giving way to the weight of the water. The problem only occurs on the top section and between the first two supporting bars on either side of the vent. Increasing the height of the roof or installing additional wire/cable between the first two longitudinal supports will reduce the risk of water accumulating on the plastic surface. A comparison between the number of rows of tomatoes that can be planted in a conventional tunnel and that of a section of a multi-span (also called a bi-tunnel), one can clearly see that more plants can be fitted into a structure that has straight sides than those structures that have round sides. Comparison between conventional tunnel (top structure) and a multi-span or bi-tunnel and the number of plants that can be planted in the width of the tunnel. Structures that have vertical sides have more space at the sides. The risk of to low arc design of the roof can result in water accumulating on between the two top longitudinal supports. If the height of the roof (currently 1.6m) is increased, the risk is reduced.